The adjective, "dark," often connotes mystery. We have dark secrets, tall, dark strangers, and the dark and stormy night, made famous in the novel, "Paul Clifford," by English novelist, Edward Bulwer-Lytton (1803-1873). This novel also contained the expression, "the great unwashed," that was often used by my father. There's a Bulwer-Lytton Fiction Contest that accepts submissions for opening sentences to the worst of all possible novels. Caricature of Edward Bulwer-Lytton, 1st Baron Lytton (1803-1873). Lytton was a politician, so the leap to writing fiction was likely not that hard. The "dark and stormy night" meme notwithstanding, Lytton was a best-selling author of his time and was one of the few novelists to make a lot of money with his art. The darkest mystery of today is the existence of dark energy, a topic that I discussed in an earlier article (Dark Matter Detected? January 8, 2015). Our familiar observable universe has been found to be just a small portion of actual reality. Conventional matter constitutes a mere 5% of the composition of the universe. Dark matter, formerly known as the "missing mass" of the universe, constitutes a remaining 23%. The universe is mostly dark energy (72%), the portion of the universe that causes the acceleration of universal expansion. The visible is just a small part of our universe. Dark energy and dark matter dominate. (NASA Illustration / WMAP Science Team). While the existence of dark matter has been suspected since 1970 when Vera Rubin (1928-2016) and Kent Ford (b. 1931) discovered the discrepancy between observed and theoretical galactic rotation rates, dark energy was conjectured to exist only after observations of accelerated universal expansion in the 1990s. While ordinary matter and dark matter had a braking effect on this acceleration in the first five billion years of the universe, they presently have a diminished affect. The Robert Frost poem, Fire and Ice, has the opening lines, "Some people say the world will end in fire, Some say in ice." Frost based the poem on the two scientific scenarios of the time in which the Earth would either be consumed in fire by a supernova of the Sun, or end as a cold rock when the Sun no longer sustains its nuclear reactions. It now appears that on a grander scale the Earth is headed towards a Big Freeze, since the observable universe and its radiation will eventually disappear from view. Astronomers are working to understand dark energy, and they are collaborating on a Dark Energy Survey, an effort that has its own website (darkenergysurvey.org). This collaboration includes astronomers from the United States, Brazil, the United Kingdom, Germany, Spain, and Switzerland. 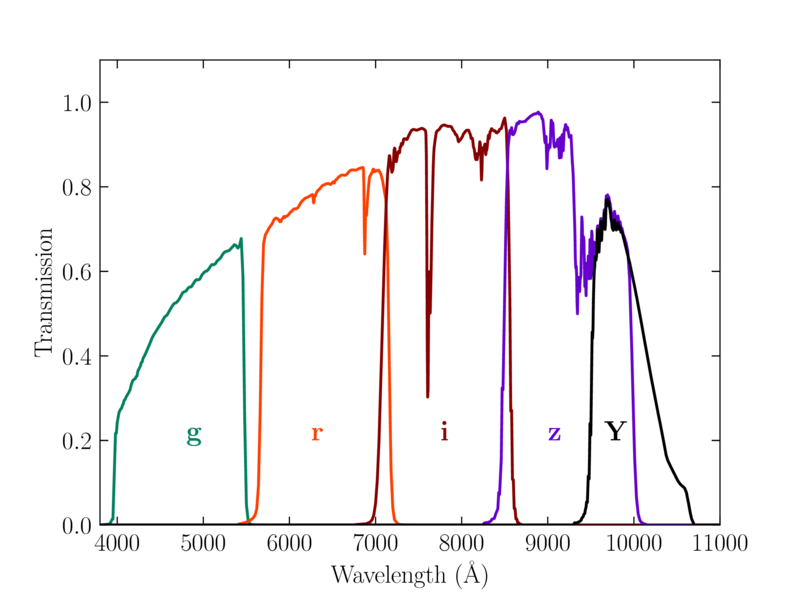 The only way to probe dark energy is by looking indirectly at its affect on universal expansion, and they do this with observations at visible and infrared wavelengths (see graph). Spectral bandpass filters for The Dark Energy Survey. The amplitudes take into account atmospheric transmission and the sensitivity of the image sensors. The Dark Energy Survey, which began in August, 2013, will image 5,000 square degrees of the southern sky. As can be imagined, this survey produces a lot of data, so there's a Dark Energy Survey Data Management (DESDM) Project hosted by the University of Illinois at Urbana-Champaign at its National Center for Supercomputing Applications (NCSA). The data are available as they are taken to the collaboration, but there are two planned public data releases, one of which has just occurred, and the other scheduled at completion. [6-9] The team has also discovered eleven stellar streams that are evidence of small galaxies being captured by the Milky Way. Looking very much like an extraterrestrial spacecraft in outline, this is the Data Release 1 region of The Dark Energy Survey. The halo of dark matter that surrounds our Milky Way galaxy has a powerful gravitational pull on smaller, nearby galaxies, and The Dark Energy Survey has discovered eleven new streams of stars around the Milky Way. These are remnants of smaller galaxies that have been pulled in, ripped apart and absorbed. Such stellar streams are are composed of relatively few stars spread out over a large area of sky, so they are difficult to find. Only about two dozen such streams had been discovered previously, many by the Sloan Digital Sky Survey. "It's exciting that we found so many stellar streams... We can use these streams to measure the amount, distribution, and clumpiness of dark matter in the Milky Way. Studies of stellar streams will help constrain the fundamental properties of dark matter." 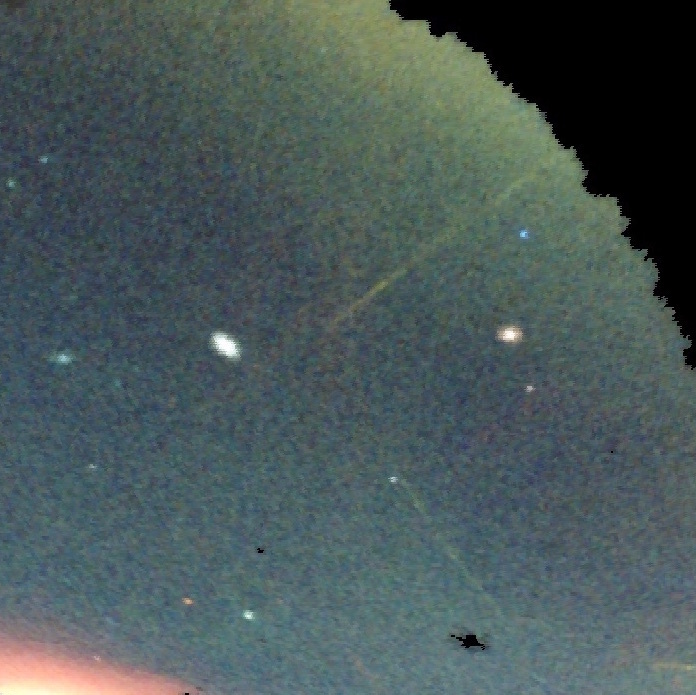 Stellar streams, as seen in a portion of the sky mapped by The Dark Energy Survey. The streams, some found previously, are remnants of smaller galaxies that have been torn apart and devoured by our Milky Way. These are shown as yellow, blue and red streaks in this image. Funding for Dark Energy Survey projects has been provided by the U.S. Department of Energy, the U.S. National Science Foundation, the Kavli Institute of Cosmological Physics at the University of Chicago, Deutsche Forschungsgemeinschaft, and many international science organizations. The elven city of Losstii faced towering sea cliffs and abutted rolling hills that in the summer were covered with blankets of flowers and in the winter were covered with blankets, because the elves wanted to keep the flowers warm and didn't know much at all about gardening. WMAP - Content of the Universe, NASA Web Site. 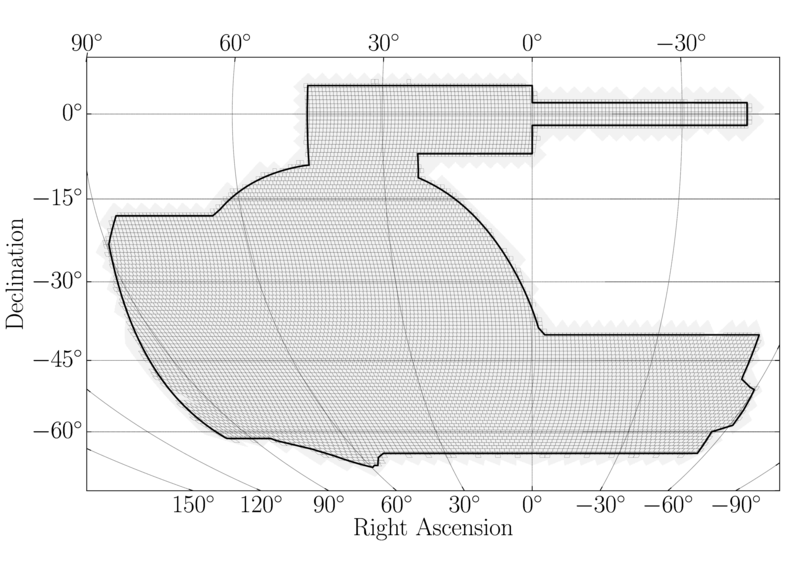 Vera C. Rubin and W. Kent Ford, Jr., "Rotation of the Andromeda Nebula from a Spectroscopic Survey of Emission Regions," Astrophysical Journal, vol. 159 (February, 1970), pp. 379ff., DOI: 10.1086/150317. Robert Frost, "Fire and Ice," Harper's Magazine, vol. 142, no. 847 (December, 1920), p. 67 (Via Google Books). The Dark Energy Survey (DES) Website. Overview of the Dark Energy Survey (DES) at the National Center for Supercomputing Applications Web Site. Dark Energy Survey publicly releases first three years of data, Dark Energy Survey Press Release, January 10, 2018. Also at Fermilab. DES DR1 Release, FERMILAB-PUB-17-603-AE-E, ES-2017-0315, January 9, 2018. Linked Keywords: Adjective; mystery; secrecy; secret; dark and stormy night; novel; Paul Clifford; English; Edward Bulwer-Lytton (1803-1873); the great unwashed; father; Bulwer-Lytton Fiction Contest; politician; fiction; meme; caricature; Vanity Fair (UK magazine); Carlo Pellegrini (1839-1889); dark energy; observable universe; reality; conventional matter; universe; dark matter; deceleration parameter; metric expansion of space; universal expansion; universe; visible-light astronomy; NASA; WMAP; Vera Rubin (1928-2016); Kent Ford (b. 1931); observation; observe; theory; theoretical; galaxy rotation curve; galactic rotation rates; age of the universe; first five billion years of the universe; Robert Frost; poetry; poem; Fire and Ice; combustion; fire; science; scientific; Earth; supernova; Sun; nuclear reaction; heat death of the universe; Big Freeze; electromagnetic radiation; astronomer; collaboration; The Dark Energy Survey; website; darkenergysurvey.org; United States; Brazil; United Kingdom; Germany; Spain; Switzerland; visible spectrum; infrared; wavelength; electromagnetic spectrum; spectral; optical filter; bandpass filter; amplitude; atmosphere of Earth; atmospheric; transmittance; transmission; photosensitivity; image sensor; DES/NCSA/University of Illinois; square degree; Southern Celestial Hemisphere; southern sky; data; University of Illinois at Urbana-Champaign; National Center for Supercomputing Applications (NCSA); stellar stream; galaxy; galaxies; Milky Way; megapixel; charge-coupled device; CCD camera; prime focus; Blanco telescope; Cerro Tololo Interamerican Observatory; Coquimbo Region; northern Chile; supernova; gravitational lensing; galaxy cluster; baryon acoustic oscillations; Type Ia supernova; flying saucer; extraterrestrial spacecraft; gravitation; gravitational; Sloan Digital Sky Survey; Alex Drlica-Wagner; astrophysics; astrophysicist; Fermilab; funding of science; U.S. Department of Energy; U.S. National Science Foundation; Kavli Institute of Cosmological Physics at the University of Chicago; Deutsche Forschungsgemeinschaft. This first major release of data from the Survey includes information on about 400 million astronomical objects, including distant galaxies billions of light years away as well as stars in our own galaxy. about 5,000 square degrees, or one eighth of the entire sky – and include roughly 40,000 exposures taken with the Dark Energy Camera. The images correspond to hundreds of terabytes of data and are being released along with catalogs of hundreds of millions of galaxies and stars.